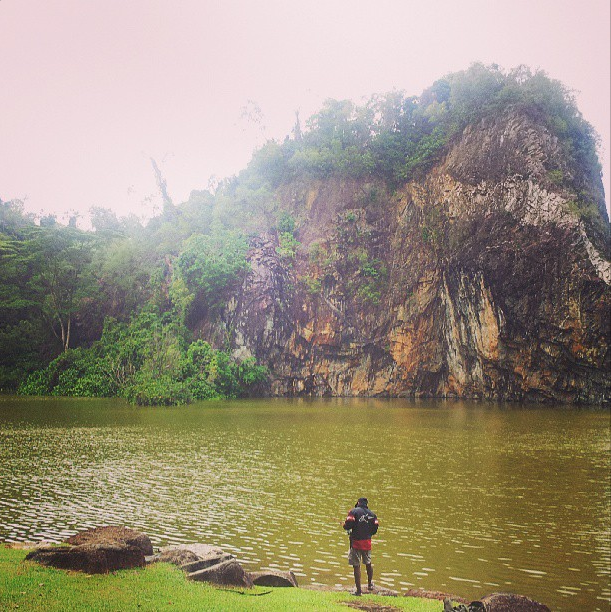 Living in Singapore, there often comes a time when you want to go somewhere to escape the chaos of the city. While browsing on the internet I stumbled upon pictures of a place called Little Guilin. The western part of Singapore, I find, is much more greener than the East. 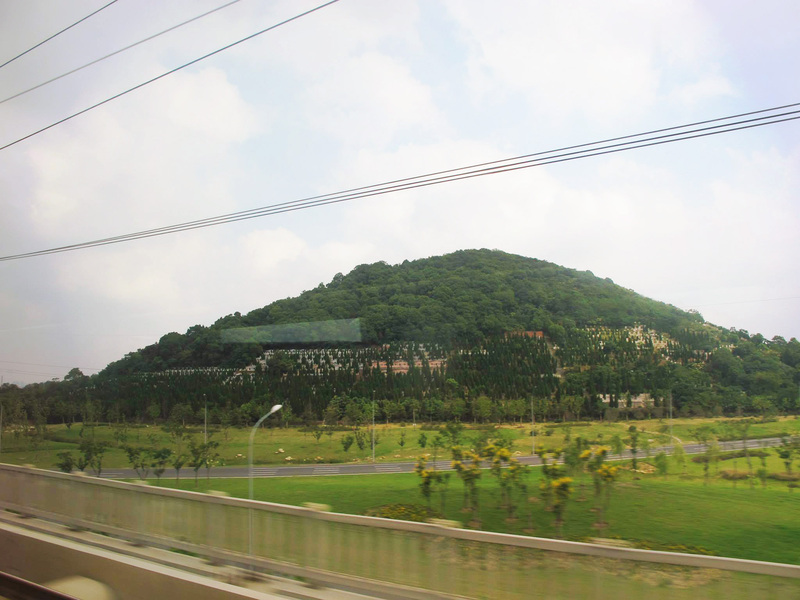 If the weather is good, it almost feels like you are living on a hill station. We left home at 11 in the morning. We alighted at Bukit Gombak mrt. Little Guilin is a very short walk from the mrt. As we walked on the winding road with a stadium on the left, we were almost wondering how could a place like that exist between the high rise condos and modern infrastructure. But as you walk closer and spot the towering rock structure from a distance, you know you are in for a treat. We spotted the lake after a few minutes. As we entered the park, it was almost like entering a small paradise. There were 2 boys fishing, a bunch of kids watching the fish struggling as it was pulled out of water and an old man sitting on a rock and watching his grandchildren play. Its like being transported in time when things were simpler. We sat on a rock nearby and simply watched the ripples on the lake from the light rain. If you avoid looking at the 2 buildings jutting out from behind, it almost feels like you’re not in Singapore. Note: Little Guilin is modelled after Guilin in China. Fancy Scorpions on a stick? 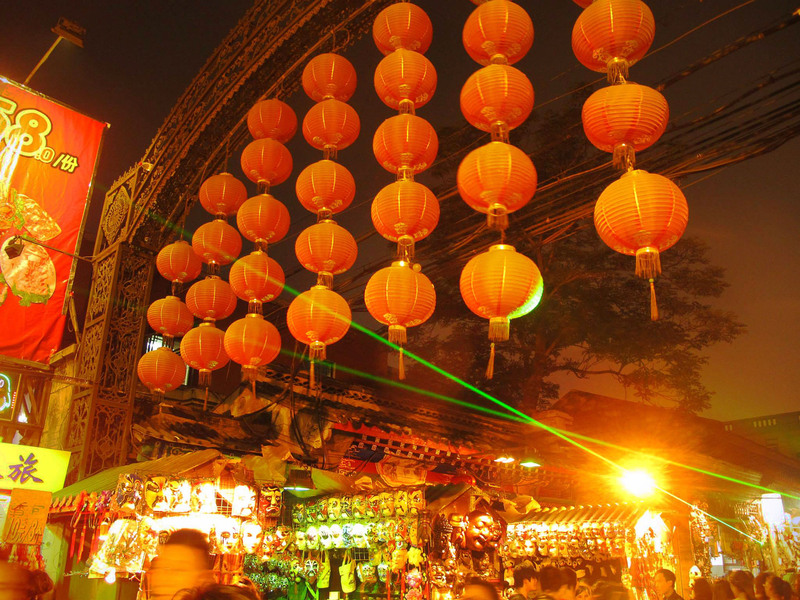 Go to the Night market in Beijing!! After the flag lowering ceremony at The Tienanmen Square, we walked down for a few minutes on a cool, crisp night and entered Wangfujing shopping street. If you are the adventurous type where food is concerned, this place could be heaven for you. But we don’t really eat much in meat other than chicken and Pork. 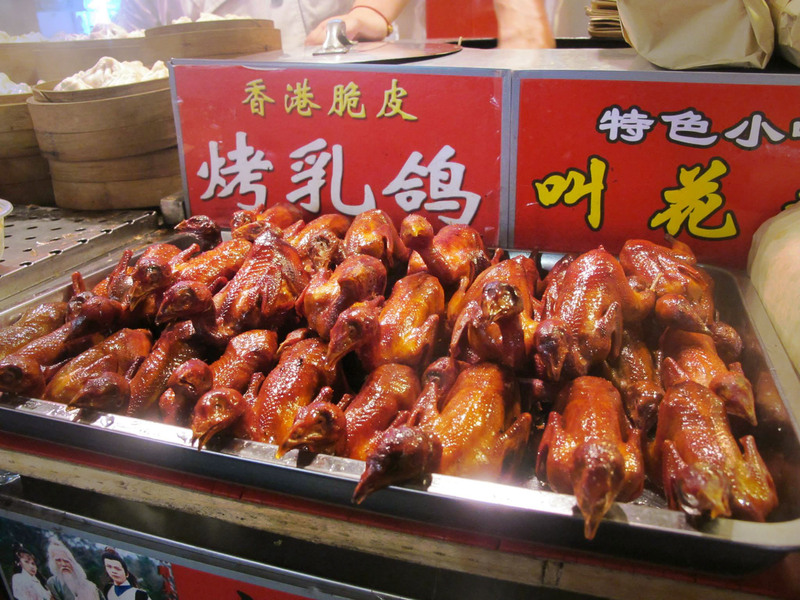 Sometimes we eat duck but definitely not when we can see the eyes and the beak. 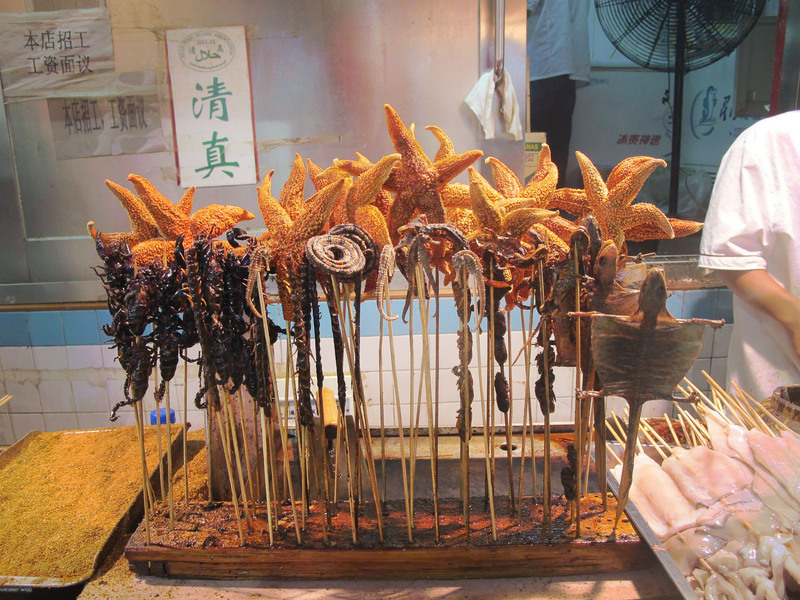 You can find dumplings, scorpions on a stick, heaps of octopuses, baby ducks, snakes and other delicacies. But don’t worry, you can also find things to eat here – satay, Duck Pancakes, kababs among other things. The atmosphere is lively, there are a lot of tourists around and generally good time can be had just by walking around and trying to recognize things on sticks. We would highly recommend this place even if it’s a place where probably only the tourists visit. Well it is known as the Venice of Shanghai. 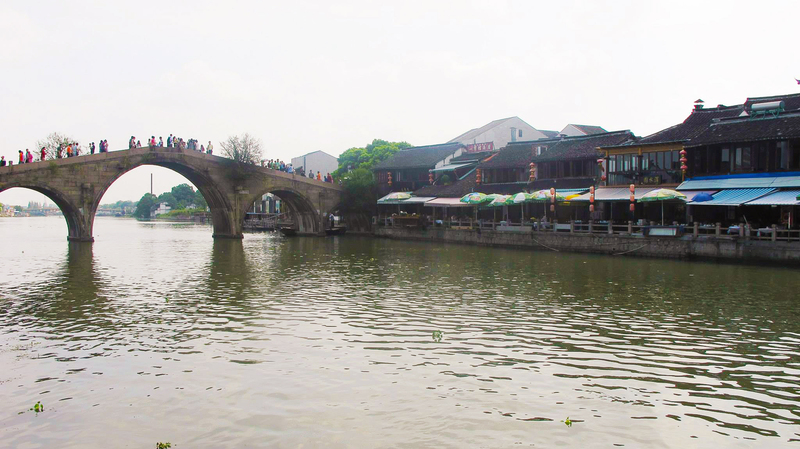 Zhujiajiao is an ancient town located in the Qingpu District of Shanghai. We had no idea how or where to buy tickets from because we didn’t want to go through a tour or an agent. We googled the ticket center address and we knew we could get a bus from there. Now this sounds easier said than done. Because if you can’t speak Chinese, good luck with making the cab driver understand what you’re saying. So we did the smart thing, got the hotel receptionist to write down the ticket counter place in Chinese and we also took a map. It still took us 3 rounds around the same junction to find the place. Again we rushed to find the counter because it was nearing closing time. We found the counter at the basement and with hand gestures and map and our Chinese translation, managed to get two tickets to the place. Thankfully everything but the date and timing was written in Chinese. 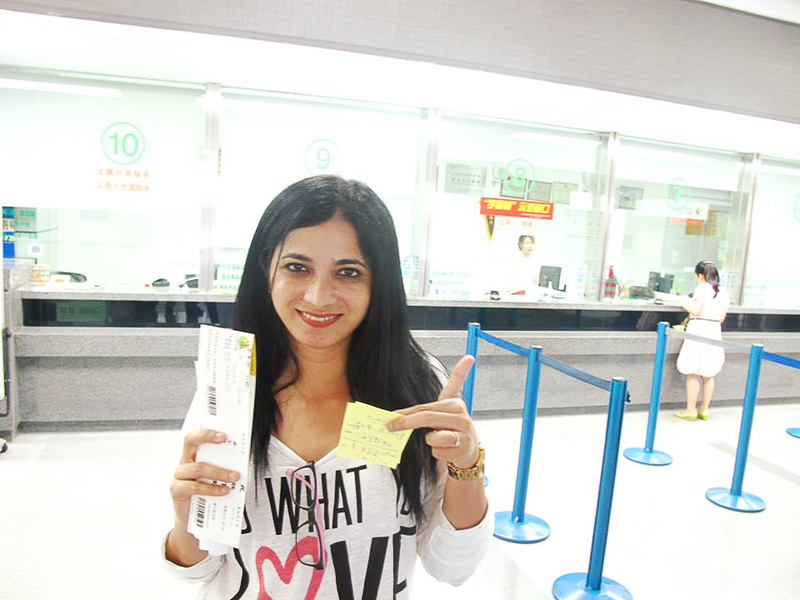 The ticket counter guy was sweet enough to point us to a English pamphlet of the place. The next day we reached 5 mins before the bus left and found it already boarded and waiting for late comers like us. All the people in the bus were Chinese and they were nice enough to point out our seats when we took the wrong seats the first 2 times. We reached the place in about a couple of hours or maybe even less. 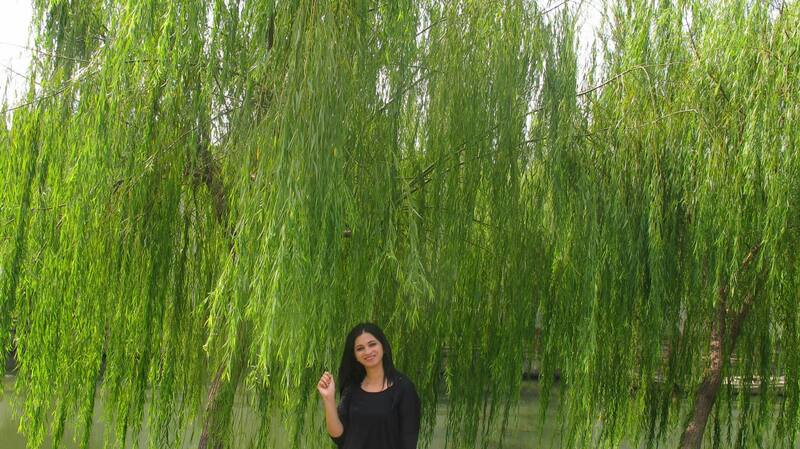 There are rows and rows of weeping willow trees that great you on the way to the entrance. Since it was our first time seeing these trees, we were kind of distracted. Zhujiajiao is what it says it is. An ancient village on water. We had fun strolling around the cobbled streets looking at different varieties of food and souvenirs, dress shops and other entertaining things.There are a lot of alley ways and small shops along the way. The small streets open up to a huge junction. There are a few cozy and pretty cafes scattered along the way and there’s Starbucks. I wonder how Starbucks found it’s way here, but it was a relief to get a reliable chai latte to lift our tired spirits. Beware of the temple in the village. We went in and couldn’t say no when the 2 Chinese temple guys separated us and took us to two opposite tables. The one who guided me saw my hand, pretended to read the lines, then wrote something down on a paper, put it in an envelope and gave it to me. Then he showed me a register to sign and obviously pay, which I was not going to go. I hate scams like this. I refused saying I had no money. He asked me to return my fortune back to him. Of course. I was only glad to return him the scrap of paper. 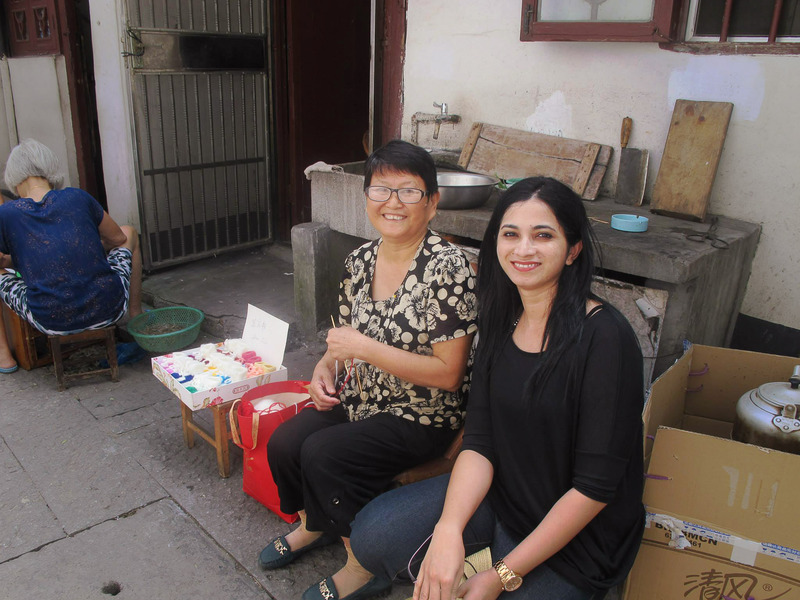 I bought soft wool socks made for my darling niece from this sweet lady. We also got our paper cut outs made. We watched a 5d movie (yes!) 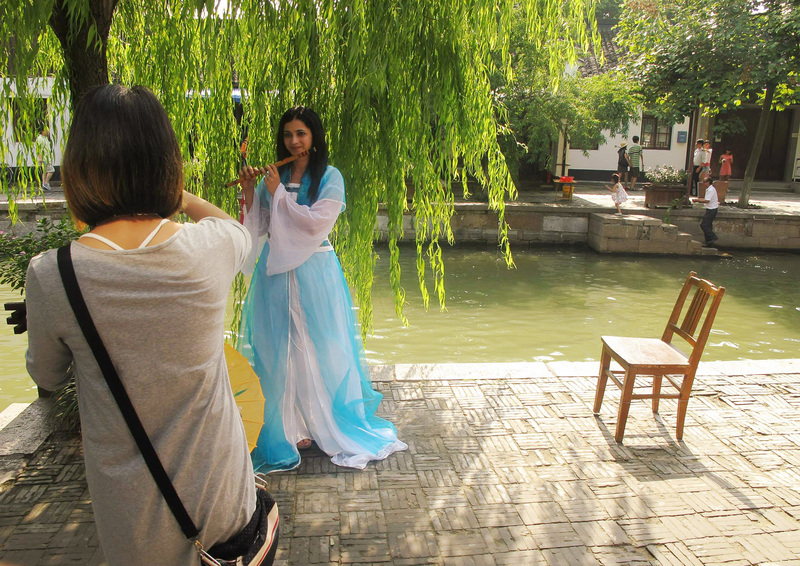 and I had my picture taken in a Chinese dress. I simply cannot resist things like that. As the sun started setting, it scattered a warm glow over the place which made it look even more beautiful. We might have enjoyed it even more if it wasn’t super hot. It’s bloody huge. It’s really huge. Did I tell you it’s huge. 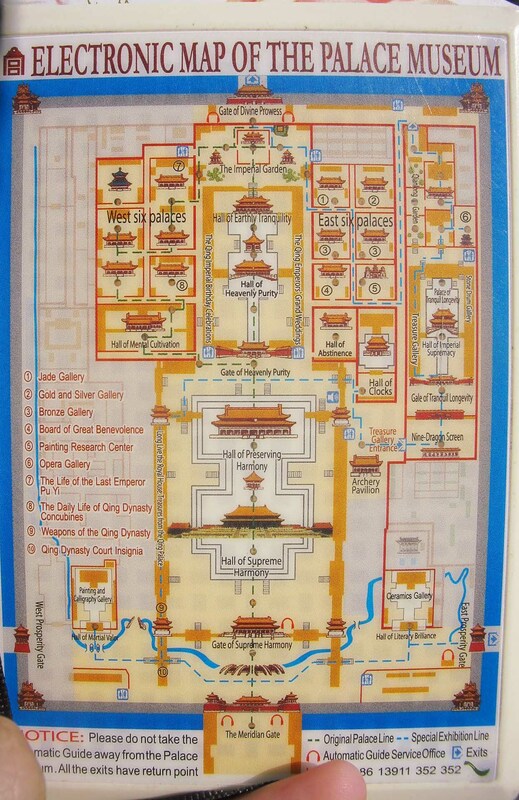 If you manage to not get lost in the palace, figuring out your way between thousands of rooms, kudos to you. 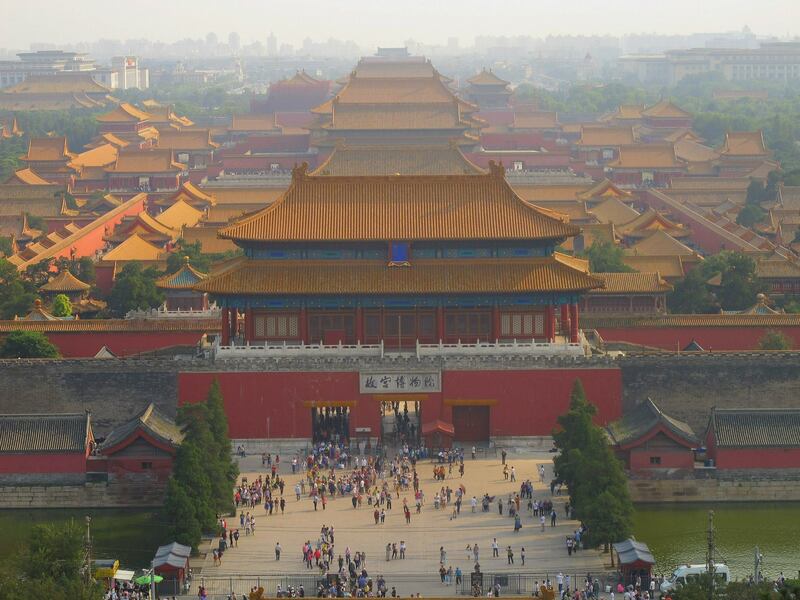 There are 9999.5 rooms in the Forbidden city, all of which are not open to visitors. 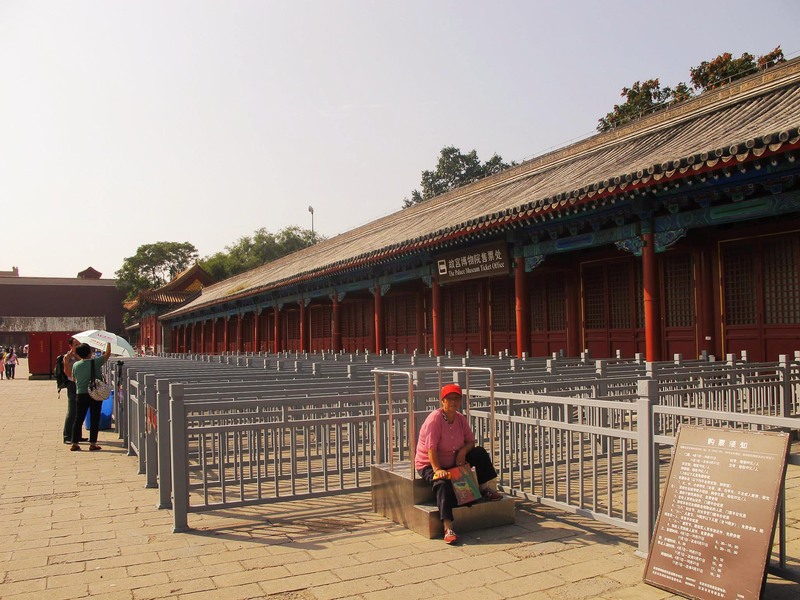 The Forbidden palace is on every China Traveler’s agenda after The Great Wall. 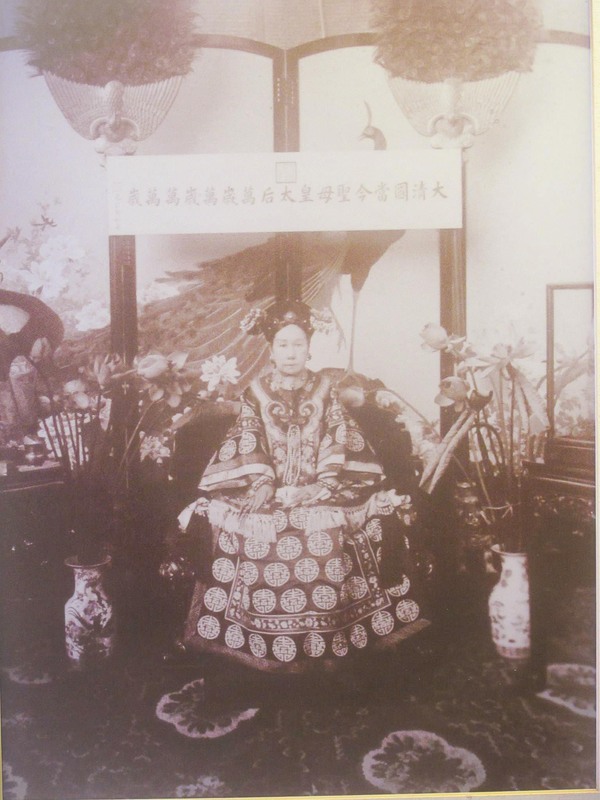 I’ve read a couple of books on Empress Dowager Tzu Hsi who was the last Empress of China. Since then I’ve been fascinated by this place. We went in early and we expected the ticket counters to have long queues but seemed like almost everyone was either with a tour guide or had purchased tickets beforehand. We went in but not before buying an electronic guide which not only looked very pretty and snazzy but was very helpful. The first thing we noticed was the crowd, there were so many people inside. I started thinking about our vacation pictures with herds of people in it. But you can’t really complain when you’re part of the same crowd now, can you? 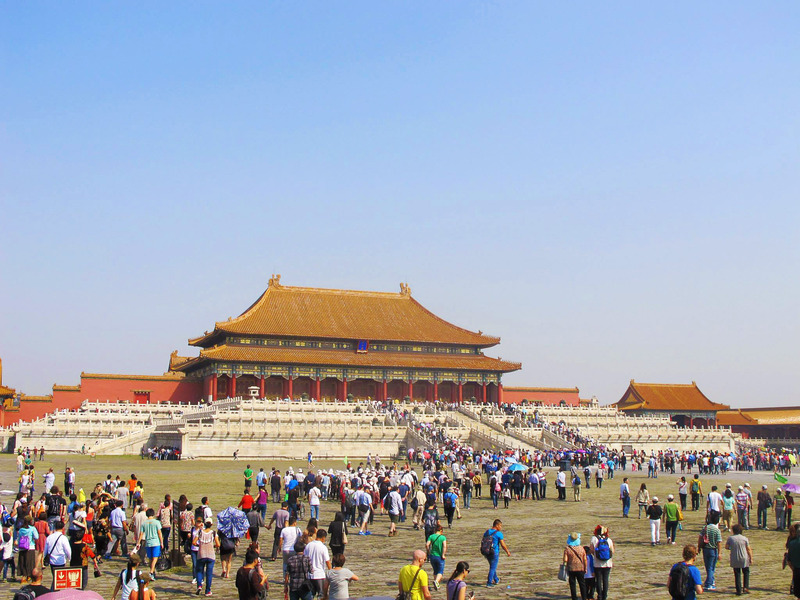 But you go further and the palace splits into 3 sections, that’s when the crowds start fizzling out. The electronic guide did a good job of explaining the significance of each structure. All the rooms and halls have beautiful, poetic names (Hall of Supreme Harmony, The Hall of Central Peace, Palace of Earthly Tranquility, Palace of Heavenly Purity, Palace of Earthly Tranquility, Hall of Mental Cultivation ) and distinct purposes. 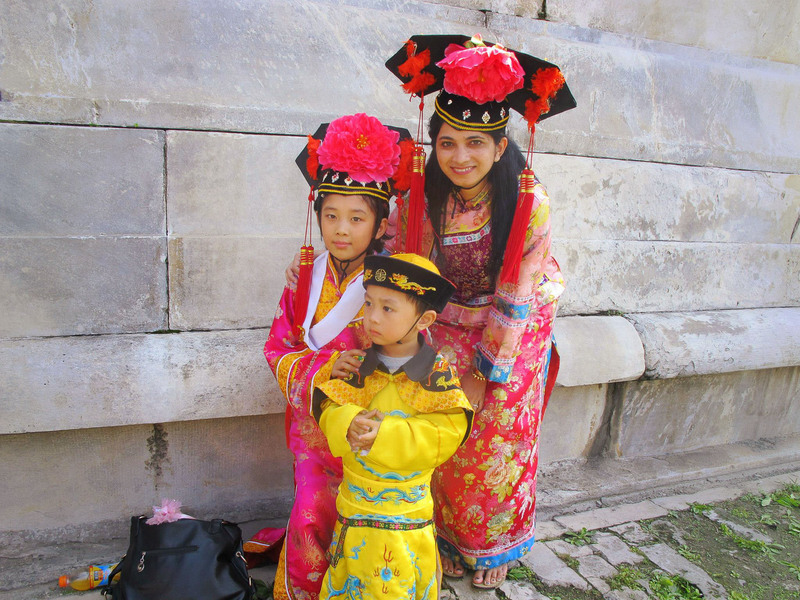 China had such a rich, fascinating and vibrant history that I feel one cannot appreciate any site fully if you don’t know the history. 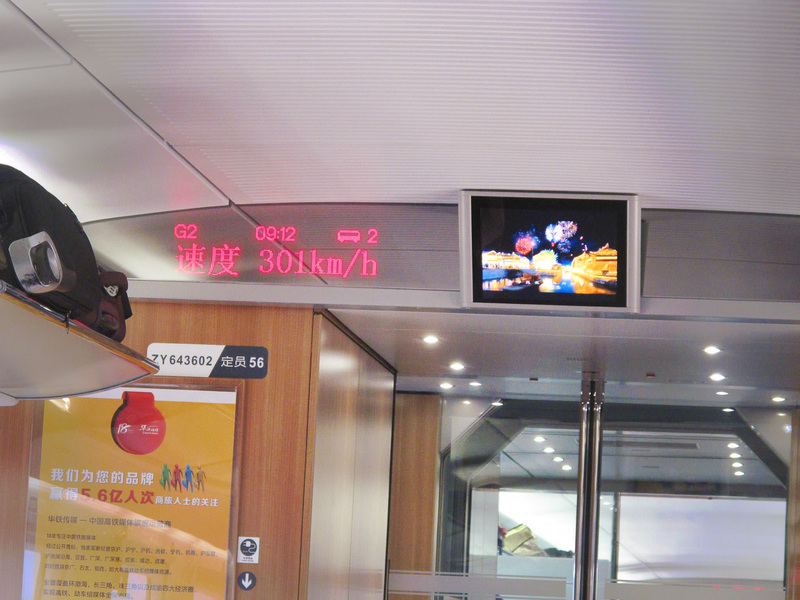 Shanghai to Beijing…on a train! 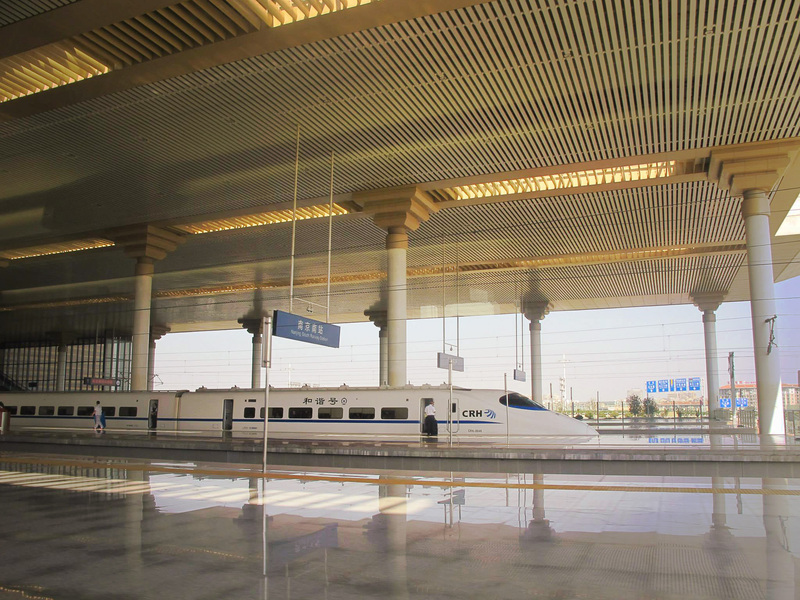 When we wanted to travel to Beijing from Shanghai and were looking for options, we zeroed in on a High-Speed Railway that travels at around 300 km/h. This rail line is the world’s longest high-speed line ever constructed in a single phase. It was more expensive than the airfare but we decided to take it for the thrill of experiencing something new. And we’re ever so glad we did. 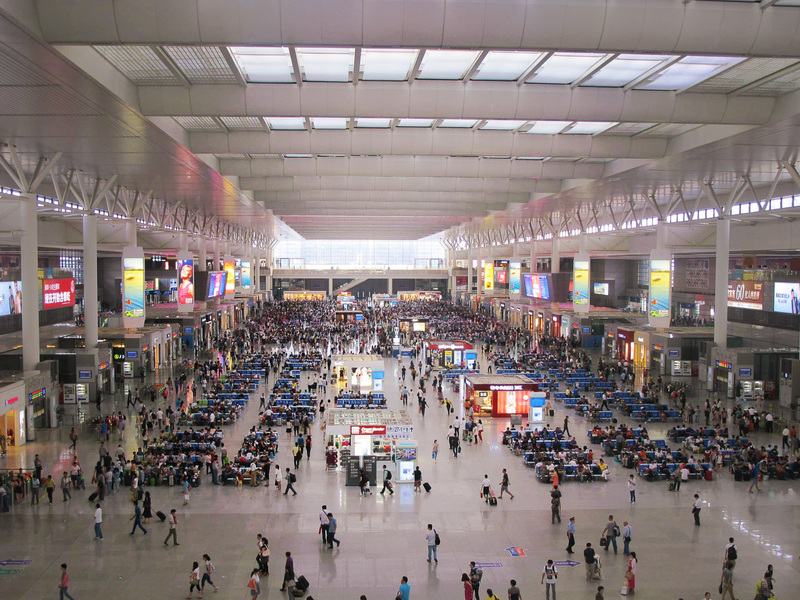 First off, the train station is huge, it’s almost like a mini airport. In spite of the chaos its very well managed. Even though we can’t read or speak Chinese, we didn’t have any trouble locating the boarding area. As far as we remember, there was no check-in luggage line. If you have bags, you can keep them in the train when you board in a separate place for bags. We bought the business class tickets but the second class didn’t look bad either. Considering there was no food served in the train I don’t think it matter what class you take. The seats for both classes looked comfortable except business class has more leg space. At 300 km/h we thought the world outside would be a blur but we could see very clearly and also take pictures. 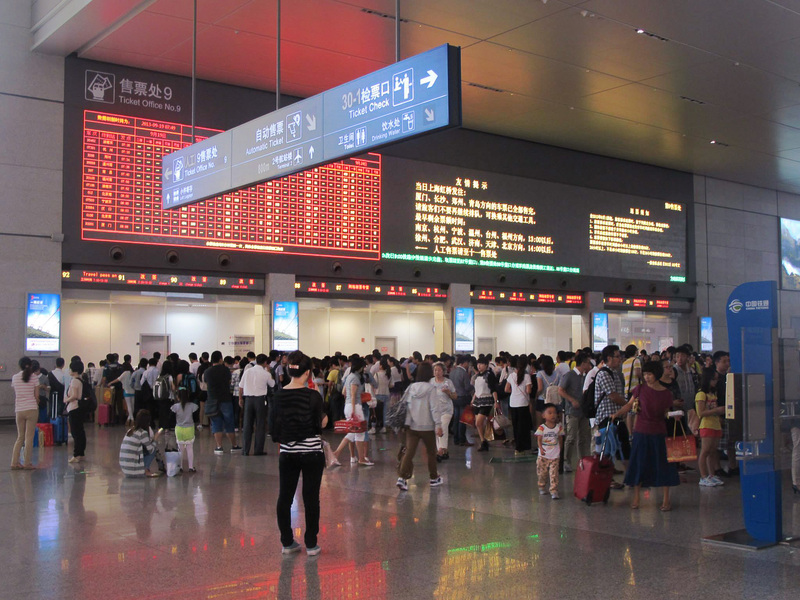 If you ever want to travel from Shanghai to Beijing or vice versa, do think about this option. Firstly, you don’t have to reach the place 3 hours in advance. One hour is fine. The boarding process so painless and quick. And the journey is very comfortable. All in all a very good experience. Not everyone of us can travel to every place in one lifetime. There’s another way though. Why Armchair travel of course. 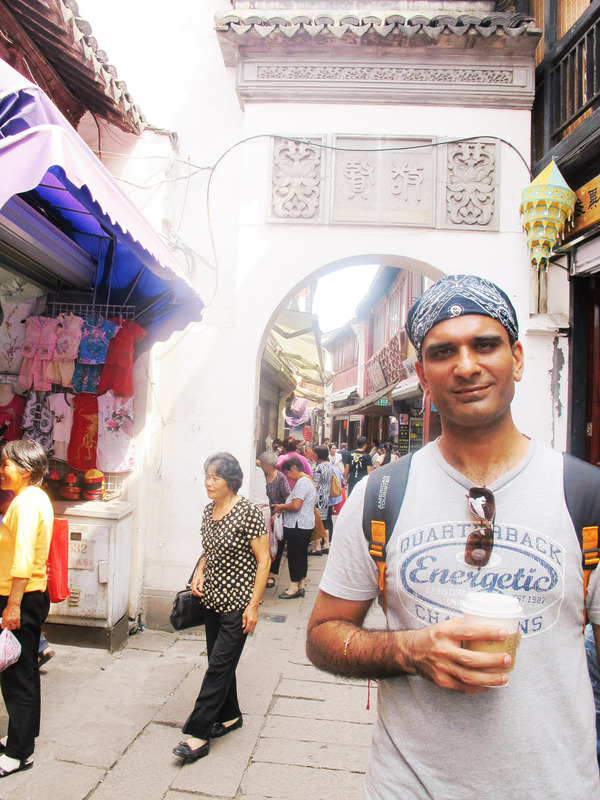 In this new feature I’ll be reviewing travelogues or books that give us some understanding of a particular place or culture at a particular time. I hope you have fun reading it. Today we go to 1986 China. When I read the words ‘China’ and ‘travelogue’ together, I instantly gravitate towards it. And the events in this book take place in 1986 when China was only recently open for travel to foreigners. We went to Shanghai and Beijing about a year back and even now, it’s very difficult to communicate because other than the hotel staff no one spoke English. We faced a bit of difficulty traveling as we had to write down the name of places in Chinese and also take the map along with us. Going anywhere impromptu was out of the question. 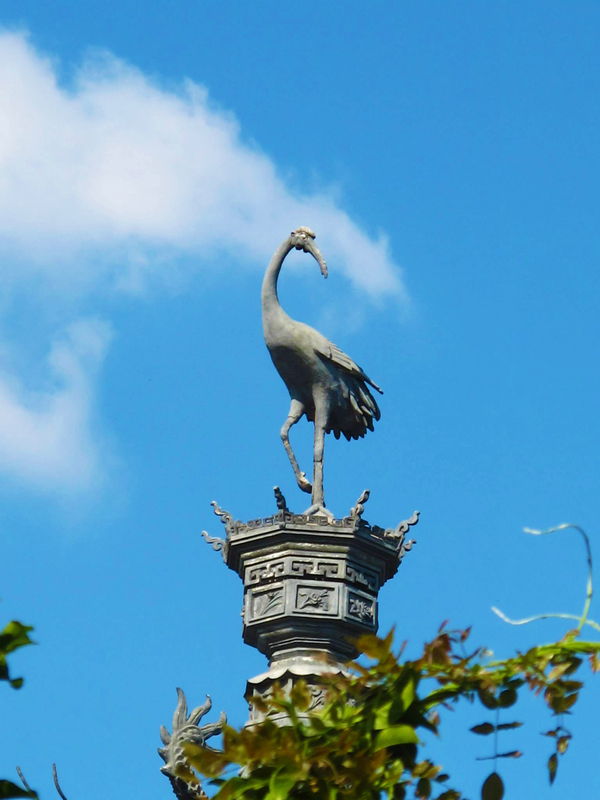 A White crane on top of an ancient structure. Everything has symbolism in China. White Crane is a symbol of longevity since it is believed to live very long. 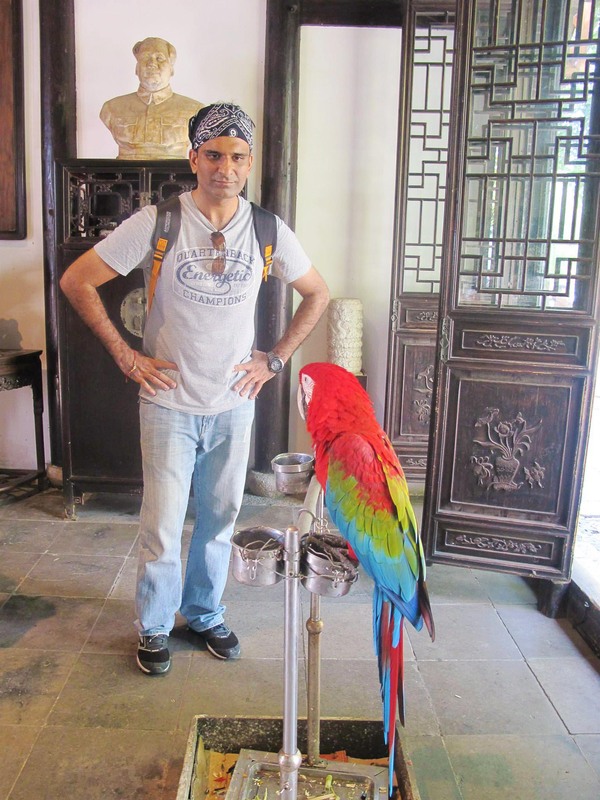 I was particularly enamored by this bird. It looks graceful and pretty perched on top of a structure against a bright blue sky. 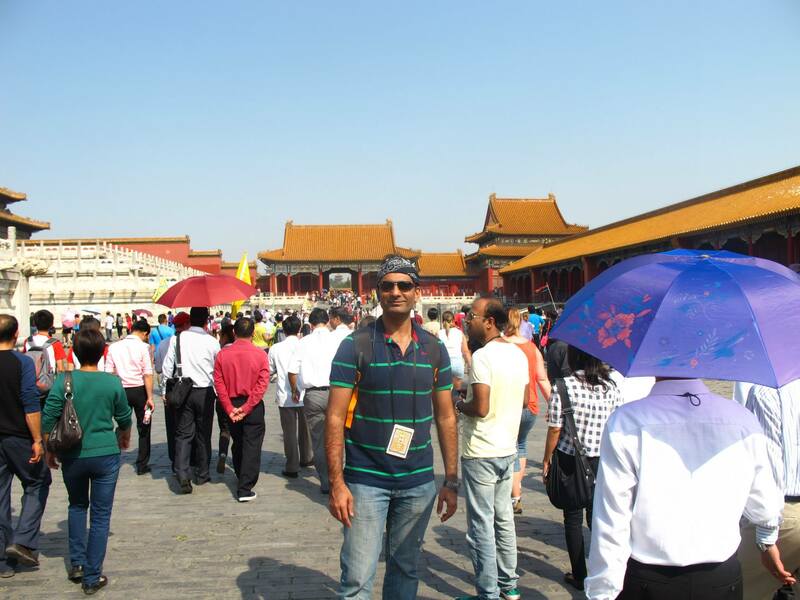 This picture is from Ancient Yu Tuan Garden in Shanghai. This Photograph is a response to the weekly Challenge by The Daily Post. 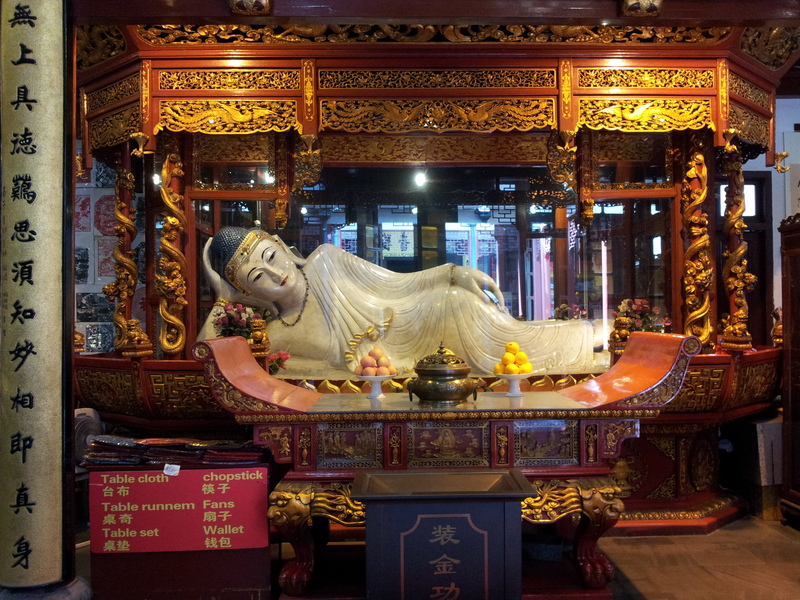 The Jade Buddha Temple was founded in 1882 with two jade Buddha statues imported to Shanghai from Burma by sea. The history of this temple is very interesting which you can read on Wikipedia. Before going to the temple i read a few reviews online and a overwhelming number of them complained of how its a tourist trap and how 3/4 of the premises are souvenir shops. But i decided to go there anyway based on the few good reviews i read. And i’m glad i did. I went on a monday. I reached around 1 and it was pretty quite with very few tourists around. When i went inside the main hall I immediately felt a great sense of peace surround me. Im not a very religious person and I’ve been to a lot of temples before but rarely have I felt so connected. The temple is beautiful and the statues have a serene look. There are different buddha halls. The Devajara Hall, Mahavira Hall and the Jade Buddha Tower. I also saw monks reciting shlokas which is a beautiful thing to hear.